conner burns will host a series of workshops at this studio on a variety of topics (potential topics listed below). if you are not able to find a date or a topic that fits your needs, simply gather 4 people and contact conner about scheduling a workshop that fits your date and topic needs. workshop length depends the topic. 2 and 3 days are most common, but longer lengths allow for greater immersion in the topic and process. - mugs & handles - this workshop will focus on making mugs and making handles that fit them well. serious manners of forming and adding handles. theory and practice of making good handles that fit the particular form. - pouring vessels - this workshop will focus on making vessels that pour. theory and practice of making pouring vessels that pour well and are aesthetically pleasing. pitchers, ewers, and creamers. - making vases - this workshop will focus on making vases in a variety of shapes - small necked vessels or large volume vessels … tall and short … anything you can think of we will cover it. 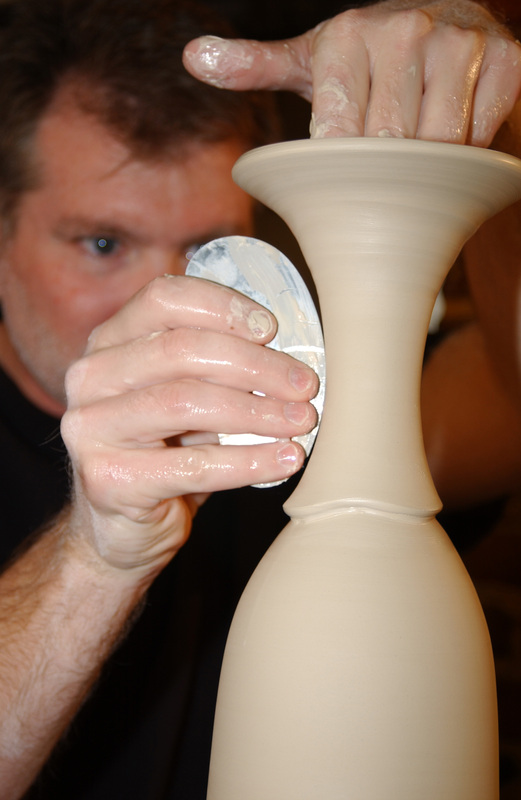 surface and trimming processes specific to vases will also be covered. - bowls & trimming - this workshop will focus on making bowls and trimming of bowls. theory and practice of making beautiful bowls and the manner in which to trim to further emphasize the form. - glaze mixing - this workshop will focus on all aspects of mixing glazes. no experience required. - spraying glazes - this workshop will focus on all aspects of spraying glazes. equipment necessary, how to produce particular effects, handling work and being safe in the process. no experience required. - plates & platters - this workshop will focus on making plates using a variety of techniques and will also focus on decorative techniques that make the plate. trimming, foot size and design … everything that relates to the theory and practice of making good plates will be covered. the same is true of platters. - wavy trays - this workshop will focus on making the process of making this particular form that conner makes. it is a combination of wheel and slab parts. the important details related to the process - making, drying, and handling will be covered. these trays are as individual as each person and are an enjoyable and expressive form to make. - sectional forms - this workshop will focus on making vessels in parts. this is a great way to make taller forms without the strength to make the form tall. we will add parts together in a way to make taller forms that work well visually and structurally. - wine vessels - this workshop will focus on making wine vessels. this could also be called chalices, goblets or ‘just fun drinking vessels’. join us to find out how to make these specific and enjoyable forms. 3 - when your payment is received you will be contacted and your registration confirmed. for complete details about registration - visit - workshop registration & policies.